I’ve been sidelined with computer troubles and non-science activities, so first, a belated thanks to everyone who left a thoughtful comment after Monday’s post and question about communicating science to the public. I appreciate hearing your views, especially from readers with a diversity of backgrounds! i.e. it shows that even in mid-latitudes (meaning northern US and southern Canada, and northern Europe, along perhaps with parts of Australia and New Zealand [?]) they are estimating a 35%-45% probability of a minor `geomagnetic storm’ tonight, with a 10-15% probability of a major storm… and a geomagnetic storm, which literally means a lot of activity in the earth’s magnetic field, generally leads to auroras further away from the north and south pole than usual. Auroras are caused when swarms of electrically charged particles (electrons and ions) from the sun arrive in the earth’s vicinity, are captured by the earth’s magnetic field, spiral down toward the north and south pole of the earth, and hit molecules in the earth’s atmosphere, causing them to glow. [Here’s a NASA flyer with a drawing and a little more information.] A strong solar flare (a giant explosion on the surface of the sun) can generate a huge cloud of charged particles (a CME, or coronal mass ejection), and if this cloud arrives at the earth it can not only generate auroras but also move the earth’s magnetic field around, with the effect that some of this glow is found well away from its usual location near the poles, over places where more humans live. And because there was a big CME on Thursday that seemed to be aimed at the earth, and because it takes about two days for such a cloud to travel out to where the earth is, the space weather forecasters are expecting the CME’s particles to hit the earth any time now It has apparently arrived! When that happens, if enough of those particles get caught in the earth’s magnetic field, we’ll start seeing auroras away from the earth’s poles. Now, something else you may have seen is this map, due to accuweather.com. The map shows where there likely will be cloud cover (red and yellow) and clear skies (green), but in one respect it is badly misleading: it has a line on it that separates the region where the auroras might be visible from the region where they are “NOT VISIBLE”. Well, do not entirely lose heart if you are a bit south of that line, and also, don’t be very sure of things if you are north of it. No one can predict very precisely where that line will be, and it will move around (quite likely northward) as time wears on following the CME’s arrival. Accuweather’s prediction for viewing conditions tonight. While their ability to predict the red, yellow and green regions (based on cloud cover) is not in question, no one can reliably predict the green line that determines where the auroras might potentially be seen. By the way, let’s ignore the breathless headline of the accompanying AccuWeather article: “Dazzling Northern Lights Anticipated Tonight” — that’s journalistic license at work. (Not to mention the article’s scientific misstatement about protons.) The auroras generated by the solar flare may be anything from a dim, quietly beautiful green wash to a bright red and/or multi-color light show, and no one, certainly not AccuWeather, can tell you which it will be, especially not in a specific time or location. So be prepared for something that’s beautiful and subtle, not dazzling. If in fact you find yourself dazzled, count yourself very lucky! Meanwhile, the later the CME arrives (and it is already a bit late) the less likely it is that the CME hits the earth head on, and the less likely it becomes that we’ll see auroras far from the poles tonight. UPDATE: The CME has arrived, a little while before sunset in New York. 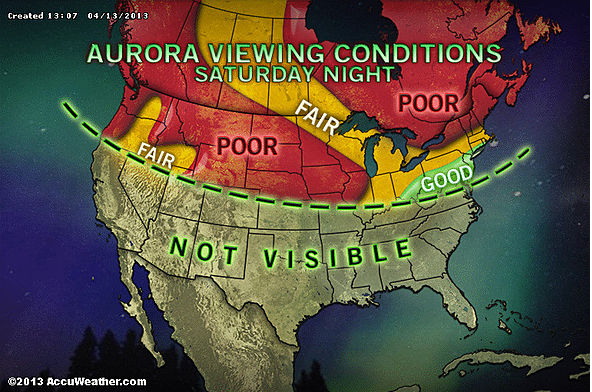 If in fact we do get auroras at all, it’s quite possible you’ll be able to see them an hour or two after sunset in the northern United States and Canada. Wishing you good luck with one of the first aurora opportunities of 2013! And if you see one, think to yourself: physics is beautiful! This entry was posted in Astronomy and tagged astronomy, auroras. Bookmark the permalink. Sorry for straying off topic a bit. Spaceweather.com has the web pages of that memorable event in 2003. Based on my review of those pages, the night of the brilliant red auroras in Washington D.C. occurred on the 29th, not the 30th — the CME from that flare was bookin’. It would have been most appropriate had it arrived Halloween night — since it created a blood red sky that evening…..
That ugly sunspot, 486, which caused all the trouble, unleashed a megaflare a week later, X40+ (revised estimates, IIRC). Obviously that flare and associated CME were not Earth directed — otherwise, y’all would have remembered it from its disastrous effects on our satellites and electrical grid, like an electronic ‘Pearl Harbor’. Here is another useful link for help in viewing Auroras across the world. This is boring. I want more Michio-Kaku-speak. Did the auroras have anything to do with the creation of the universe? It’s another inaccu-weather forecast, what did you expect? Gaia got you with her dazzling light show. Gaia is like a girl who bats her eyes at you so you won’t noticed her weakness or carelessness that she unwittingly showed and therefore need to hide it somehow by batting her eyes at you… a dazzling light show! There is something terrifying about auroras, it means that the Earth’s magnetosphere was breached and allowed tons of harmful CME particles to enter our atmosphere. Mars’ magnetosphere was weak and failed to deflect a massive CME that consequently ripped off its atmosphere. Anyways, Gaia advocates say it’s alright, she is just sampling the ‘pathogens’ so she can manufacture appropriate defences… Like a mother that instinctively kiss her dirty baby to sample the pathogens so she can manufacture anti-bodies and incorporate it in her milk… to raise the immunity of her baby. So it’s alright auroras reached new york? The sun sneezes from time to time and we called it CME and it annoy the neighborhood. Our magnetosphere is like a handkerchief that we use to cover our noses when somebody sneeze.. never mind the Gaia advocates, I think our handkerchief is inadequate what can we do about it? NOAA space weather forecast is valuable for satellite operators and earth based communication companies, but it’s only for contingencies.. I wish there is a long term planning going on. My GPS is still working, no plan to put the 24-satellite GPS constellation to sleep? Probably the 5-satellite THEMIS constellation will be working in the storm, poor satellites I wish they will be alright. But some winter nights in Alpena Michigan in the late 1940’s were as spectacular as recent photos from Alaska. If you get a chance do not miss seeing the “big ones”. You will remember them.